Born and raised on the largest Aran island, the music of bilingual artist Padraig Jack is influenced by his surroundings as much as it is by James Taylor, Van Morrison, Paul Brady and The Eagles. 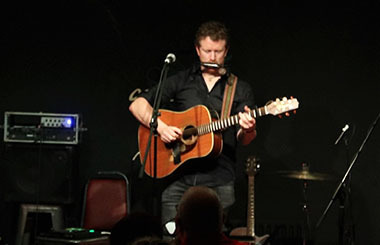 While he has had plenty airplay on RTE Radio 1, iRadio, Raidió na Life and is practically part of the playlist on RTE Raidió na Gaeltachta, Padraig’s live shows are developing his reputation as a singer and songwriter of substance in both English and Irish. He has thus far opened for The Saw Doctors, Donal Lunny, Mick Flannery, The 4 of Us, John Spillane and has appeared at the Westport Bluegrass Festival, SOMA, Shorelines, Skibbereen Arts Festival and Electric Picnic. Padraig recently sold-out The Crane Bar in Galway and the Cobblestone venue in Dublin in what was his first headline show in the capital. With 4 Gradaim NÓS Award nominations in early 2018 (including both Song and Artist of the year) Padraig won second prize at the Pan Celtic National Song contest in 2018 and also had a song feature in an RTE 1 television documentary. Padraig is currently recording his debut EP with John Reynolds (Sinead O’Connor, Damien Dempsey) with plans to release it in spring 2019. Rugadh agus tógadh an ceoltóir dátheangach Padraig Jack in Árainn agus tá ceol Padraig faoi tionchar ag an dtimpeallacht in Árainn agus amhránaí dá leithéid James Taylor, Van Morrison, Paul Brady agus The Eagles. Fuair ceol Padraig go leor craoladh ar na stáisiúin ceol náisiúnta cosiúl le RTÉ Raidió 1, Raidió na Life, Raidió Fáilte agus tá a gcuid ceol ar Raidió na Gaeltachta go minic. Le imeachtaí in eineacht leis na Saw Doctors, Donal Lunny, Mick Flannery, The 4 of Us agus John Spillane taobh thiar dhó, tá Padraig ag fáil cleachtadh ar na Féilte ceol san deisceart agus an tuaisceart na hÉireann le imeachtaí ag SOMA, Féile Ealain Shorelines, an Sciobairín agus Electric Picnic. Dhíol sé amach an Cobblestone i mBÁC le gairid freisin. Bhí Padriag ainmnithe le cheithre gradaim NÓS ag tús 2018 ( ‘Amhrán na Bliana’ agus ‘Banna/Ceoltóir na Bliana’ san áireamh), bhuaigh sé an dara duais ag an comórtas Pan Ceilteach náisiúnta 2018 leis an amhrán “i bhFostú sa bhfiántas” agus bhí amhrán eile aige “Brú Do Bhealach Féin” ar clár fáisnéis ar RTE 1 i Márta 2018! Tá Padraig ag taifeadadh a chéad EP faoi láthair i Londain agus tá sé ag súil go mbeidh sé reidh roimhe samhradh seo.